It has been a bloody long time since I posted a recipe. Why? Honestly, I have been very lazy at trying new things. It isn’t that I haven’t been cooking – I still take a weekly trip to the market on Saturday mornings, but for the last few months I have been cooking the exact same thing every week. Boring, I know, but I haven’t had the head space to think about other options. Until now. This dish is inspired by one of the most delicious things I tasted when I lived in Melbourne. I worked as a waitress in a cute little neighbourhood restaurant called Huxtable, which sadly closed down not long after I left. 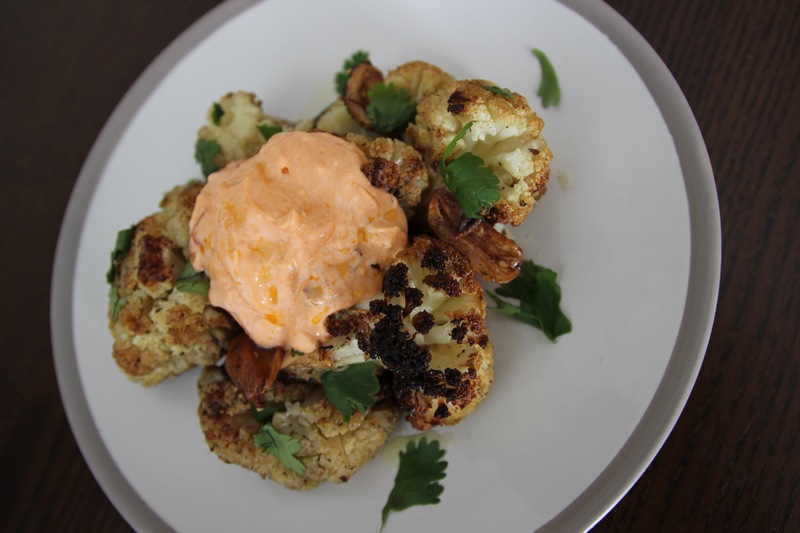 This cauliflower with harissa yoghurt had been on the menu since the restaurant opened in 2012. And remained one of the favourites until they closed their doors. Try it and you’ll see why. The only real difference between their version and my version is that they deep fried it. I’m not nutty enough to buy a deep frier for my house, or even attempt to do it in a pan, so I oven roasted it for ages in olive oil instead. Previous PostElectric Castle review: Have Franz Ferdinand still got it?